My son will be 4 in 3months. He was probably a late potty trainer in that we didn't start until a couple months before he was 3 because he just never seemed ready (and his sister was born on his 2nd bday). He never had much problem pee training and took about 6 months to poop at least half of the time. We are coming up on the 1 year anniversary of him being potty trained and we are still struggling a whole lot to poop! He never had constipation problems, however I think that he holds it now so may be struggling with that. He did have a couple months where he was pooping on the potty about 90% of the time. However, now it is back to about 40% of the time, and when he does poop on the potty we have to catch him in the act right before. Most of his accidents happen at home as he usually holds it at daycare, but more recently he has been doing it at daycare too. I really don't think he's ever gone a lot in the toilet at daycare, when he was doing good, he just started to be able to hold it until he got home. I feel like we have tried everything, books, rewards, constantly asking him, he does not tell us when he has to go. He will throw a tantrum if he's not ready, there's no way to just get him to sit there. Once we seem like we have a good reward or trick, he doesn't seem to react to it the next time. He has not had any changes to his life, he has been at the same daycare since he was 3 months old, the same class and teacher and students since he was 3, the same house, same schedule, no new siblings, and I am starting to add more fiber in his diet. He doesn’t get upset when he has accidents and often doesn’t tell me when he has accidents. Wow...sorry it got so long, didn't know I could write so much about poop! Please know that he is not alone. As a general rule, I don’t worry about potty training until a child is actually four and still not potty trained. Even then there is often little a parent or pediatrician can do. Our sixth child took the longest to potty train. He is super smart and had experienced parents, but he just did not care. You simply cannot force him to potty train, it must come from your son. How do you get him to care? In our home to be defined as a “big boy” you must be potty trained. When our non-potty trained 2 or 3 year old try to claim the title of “big boy” we correct them. We often say things like “You do a lot of things a big boy does, but you are not a big boy yet because you do not put all your pee pee and poo poo in the potty”. During diaper changes we will often say “someday when you’re a big boy we won’t have to change your diapers”. We have found this repetitive “big boy” talk encourages them to potty train and be “grown up”. In your son’s case, I’d like to suggest a different plan. One that has been successful in similar situations to your son’s. For the next 6 weeks, stop trying to potty train your son and begin potty training your 2 year old daughter. Don’t talk to your son about potty training. Don’t talk to your husband about potty training your son while he is around. Focus on his younger sister. 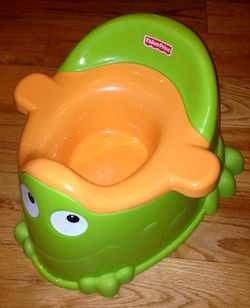 Begin to encourage your 2 year old to sit on the potty. Both you and your husband need to encourage her efforts. Give her treats for trying. Let your son see see her sit on the potty. Talk to her about becoming a “big girl” and “going potty”. Eventually, most older brothers will become competitive and actually initiate potty training. Potty training is often seems like it will never end and then suddenly it does. It always seems easier looking back (once he is already potty trained). Promise me you won’t become one of the grandmothers who swears potty training was easy and done by 12 months.